Used in 24 recipes at an average of 0.834%. This citrus forward fruity black tea vape. 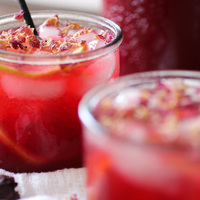 I have been wanting spring to start here in NYC so while dealing with the snow outside, I was dreaming of sipping something like this on a hammock somewhere sunny and warm. The tea is a lighter element to this mix. I like the Black Tea flavor tho its really close to a sweetened tea. I wanted to help back it up and make it blend better with some of the citrus elements found in Hibiscus. The Pink Guava is definitely the more dominate note. One of the things it boost this recipe to make it feel more like a tea is upping the astringent element drinking tea provides. Black Tea already does that some. I have been wanting to find a good recipe to use this Lychee flavor in for a while. Its an excellent lychee flavor. Its pretty strong even in lower % so be careful. Since this was a bit sweeter than I wanted, I then used Pineapple to add a nice tropical citrus. Came out delicious. The flavor will stick to your coils for a little bit. I tried this right after mixing it and was pleasantly surprised how close it felt to drinking a tropical fruity tea. After a few days, it really blends together well and mellows out enough that it isnt as much of a guava punch to the tastebuds.